Notes: One of two cairns on Yes Tor. 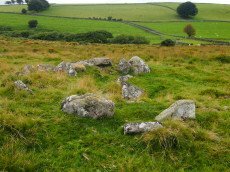 On the top of the flat outcrop of Yes Tor and piled against the west side is an amorphous mass of stones representing a ruined cairn. The patch of stones on the top is more or less 14.0m across and 0.3 m high and the piling against the outcrop is 2.3m high. 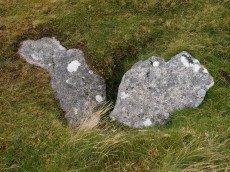 It is possible that this has resulted from bulldozing the cairn over the side of the outcrop but the stones appear quite stable and compacted. The central excavation is approximately 12.0m across and extends to 0.5m below the natural ground level. In the base of the hollow and on its south side are three partly buried slabs each about 1.7m long, 0.2m thick and more than 0.5m wide, which look like the displaced remains of a former cist. Notes: Grinsell OKEHAMPTON HAMLETS 1. Butler Volume 2 Map 42.1. Western of two round barrows on the summit of yes tor. About 36.6m nw of flag staff on the top of yes tor is an incomplete ring of rough granite boulders varying in size but generally 0.3m - 0.9m. Long. The ring is about 6.1m long and is defective on the north east side where there is evidence of a slightly sunken trackway. In the interior of this ring the ground is slightly irregular and contains blocks of granite. At the south western part of the circle a smaller circle of stones abuts on the previous circle.